After last week's story, hopefully you've got your "problem" users accounts identified. With that worked out, let's see about finding problem applications. 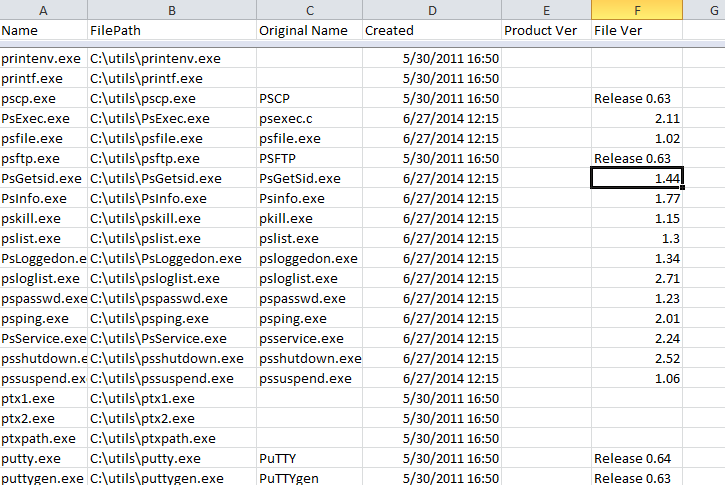 and finally, it's a decent shot at finding installed malware that your AV product might have missed. First, let's look at the powershell command to list installed software. This is a rough equivalent of control panel / programs, or "wmic product list"
Great, you say, how is inventorying things one file at a time useful? Let's use get-childitem recursively and pull all the EXE's in one shot. This is a reasonable way to grab everything. With that in a spreadsheet or database, you'll likely want to delete duplicates entries (multiples for MS Office for instance), then after a closer look, store that as a baseline to track for changes at a later date. Note that not all values are populated in the metadata for every file - that's just the way it is when you're processing standalone files like this. Using this approach, you can see that with maybe an afternoon of scripting effort, you can set up a system that you might otherwise pay thousands or tens of thousands of dollars for - assuming that you're OK running your software inventory system from the CLI. For me, running my inventory from the CLI would be prefered, but I guess you figured that out ! Have you found a trick to process information like this more efficiently? Got a better script to collect this info more simply? Please, share using our comment form! Very useful and necessary step to be able to identify unwanted system changes and possible malware. It's also important to run these commands as an admin to make sure you have permissions to scan all directories on the system. Another piece of metadata you might want to collect is the hash of each file using Get-FileHash - https://technet.microsoft.com/en-us/library/dn520872.aspx. Then you have something you can quickly throw at your favorite hash reputation service to validate an unknown file you've found. about running WMI queries against win32_product. n being short for name and e being short for expression. There are also many commercially available version/patch scanners. To name a few examples: ScanCircle, Secunia PSI/CSI, FileHippo. These are free for personal use, commercial use often requires a license. Thank You Rob! Two excellent and useful posts. I also have a subscription to powershell.com, where they produce a regular email newsletter with equally excellent tips almost daily.